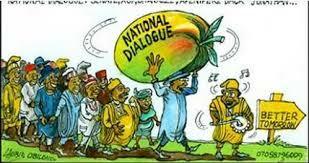 The delegates at the National Confab have been on deliberations in the 20 committees they had been split into. Interesting news coming from tabloid reports inform me that Nigerians did in fact respond to the request by the National Conference Secretariat to send in memoranda embodying the different areas of life they wished committees to deliberate on. 1. Why is it that the broken down numbers of memoranda sum up to 324, 5 more than the reported total number of memoranda? Surely with the rate at which authorities and media confuse numbers these days we all must now know the importance of carrying a pocket calculator! 2. And this one just occurred to me; are the delegates allowed to recommend a cut in the emoluments of government officials, or is that an untouchable? 2. A lot of delegates seem unconvinced on the workability of a state police in the Nigeria of the near future. It remains to be seen if this skepticism extends to other matters or not.